The ABB i-bus KNX DALI gateway with emergency lighting function combines modern flexible lighting control in intelligent building control systems with DALI emergency lighting. Up to 64 DALI devices can be flexibly installed via 16 lighting groups and controlled and monitored by KNX. Normal DALI lighting and DALI emergency lighting can be combined as required. Lighting scenarios can support the room utilisation demands with up to 14 scenes. A staircase lighting function with a switch-off warning and basis brightness facilitates time-dependent lighting control, particularly in halls or warehouses. With the integrated master-slave operation, any lighting groups can additionally optimise the energy consumption in buildings with a KNX light controller or presence detector. The DALI gateway with emergency lighting function supports the DALI standard EN 62386-202 that specifies DALI self-contained emergency lighting. 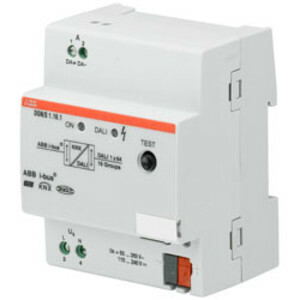 Here the cyclic monitoring functions of emergency or safety lighting with individual batteries can be activated via KNX, and the test results are sent with the aid of coded telegrams via KNX to a higher-level emergency lighting panel. The emergency lighting tests (functional test, duration test and partial duration test) are undertaken autonomously by the DALI converter in the emergency lighting. Information relating to a lamp and ballast fault is individually available for a lighting group or for a DALI device on the KNX. The commissioning of the normal DALI lighting and the DALI emergency lighting is undertaken via a separate set-up tool that assigns the DALI devices to the lighting groups and adjusts the brightness of the emergency lighting. Furthermore, the error state of the DALI devices is also displayed in this tool. 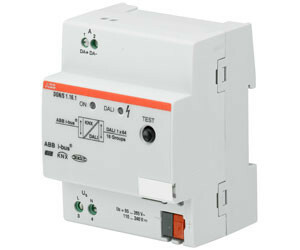 I am interested in ABB i-bus KNX DALI gateway with emergency lighting function .